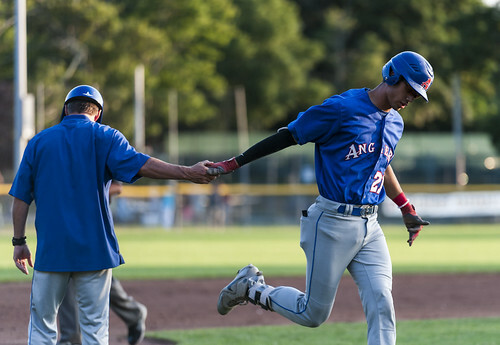 The Chatham Anglers (14-12-2) will look to continue their winning ways against the Harwich Mariners (13-15-1) on Saturday evening when the two sides meet at Whitehouse Field. The A’s won their first three matchups against the Mariners. The Eastern Division foes will face off three more times before the regular season concludes on Aug. 2. After losing four of five games from July 4 to 9, Chatham has turned it around of late. The Anglers have won four of their last five and now sit do points back of the Eastern Division-leading Y-D Red Sox. Chatham defeated the Orleans Firebirds, 4-0, on Friday night. It was the Anglers first win over the Firebirds this summer. The shutout victory marks the A’s fourth such win of the season. Blake Sabol (Southern California) gave the Anglers an early lead on a solo-shot in the second inning. The ball was sent a few feet to the right of the flagpole beyond the right-center field wall. Blake Sabol smacked his fifth homer of the season Friday, joining five other players for league's lead. As Dan Hammer (Pittsburgh) molded his best outing of the season, Chatham continued to tack on runs. Sacrifice flys from Greg Jones (UNC Wilmington) and Sabol put the A’s up 3-0 before Drew Mendoza (Florida State) finished Chatham’s scoring with a sixth-inning RBI single. Hammer pitched six innings and allowed three hits. Jack Conlon (San Jacinto) tossed a hitless final three innings in relief, allowing just one baserunner via a walk. During the Anglers’ stretch of four losses in six games from July 3 to 9, they achieved both wins against Harwich. In the most recent matchup on July 7, the A’s used a five-run fourth-inning to down the Mariners, 9-6, at Veterans Field. In the win, nine different Chatham players recorded a hit. Jones and Michael Busch (North Carolina) each tallied two hits while Sabol plated three RBI. In their only visit to Whitehouse Field this season on July 3, the Anglers tallied their highest run total of the season in a 13-6 triumph. Again, it was Busch and Sabol who headlined Chatham’s offense. The duo combined for five hits and four RBI. Tristin English (Georgia Tech) blasted a sixth-inning grand slam to put the Anglers up by five. Harwich has lost five of its last seven contests, including a 2-1 loss to the Brewster Whitecaps on Friday. Tanner Morris (Virginia) and Aaron Schunk (Georgia) rank as the Mariners’ top two hitters. Morris has played in just one of three games against Chatham, recording two hits and two runs in a loss on July 7. Schunk has participated in all three games, going a combined 3-for-10 with three RBI. Harwich has lifted itself from the bottom of the league in several offensive categories but still sit third-to-last in runs (113) and hits (233). The Mariners’ pitching staff, however, possesses the lowest ERA (3.15) in the league and has allowed the fewest earned runs (89).